Mini bus (150Baht) direct from Udon Thani airport to Friendship Bridge. The bus can drop and wait for you at a photo shop if you need photos for visa application at the borders. Shuttle bus (15Baht) to cross the bridge. Currency exchange is available at the borders. TukTuk/Taxi (200Baht for the whole vehicle) from bridge to Vientiane. I shared a Tuktuk with four other travelers, so we ended paying 40Baht each. My plane landed at Udon Thani airport just after 8am and I managed to clear the customs only at 910am. After the transports described above, I reached PVO motorcycle rental at 12pm. At PVO, the Honda Baja 250 scrambler I had selected was cleaned, serviced and adjusted. After loading up my pack and attaching my Garmin GPS receiver, I was finally ready to start my motorcycle tour at 2pm. The first place I visited was a petrol station. Some friends would ask me how I get the petrol attendant to top up the petrol when I cannot speak their language. All I did was make a horizontal wave of the hand above the petrol tank and said the word “full”. All the petrol attendants I had encountered so far seemed to get my message. Locals usually top up petrol by the dollar or Kips (Laotian currency) though. I didn’t do so because I am a lousy gauge of how much petrol my tank can take and I always like to top up as much as possible. The attendants are smart enough to stop filling at a round figure so you would not have to take small changes. Of course, at villages where they sell petrol by the litre, all you need to do is to show your fingers. 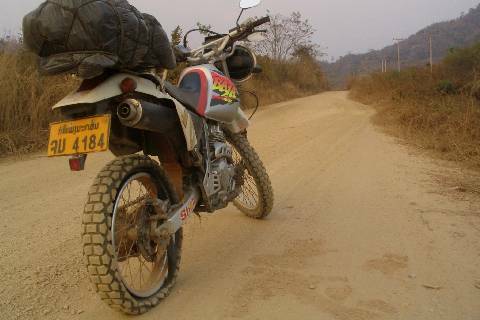 The road along the Mekong river and Thailand-Laos border from Vientiane was not in the best condition and my progress was slow. There were also branch offs and I often rode into small villages and crossed crudely-constructed log bridges, only to find myself doubling back to try another road. By the time I reached Pakchan village (GPS N18 09.254 E102 01.140), it was already 4pm. I kept traveling west, hoping I would reach bigger towns like Pak Lay or Xanamkhan soon. Unfortunately, when I was at a junction not far from Namhi village (GPS N18 02.328 E101 53.493), I discovered that my motorbike had suffered a punctured tire. Helpless at fixing motorcycles, I decided to ride the wobbling bike back to where I last saw civilisation – Namhi. It was a slow 2km ride. I can’t help feeling disappointed and worried about my predicament. With my confidence waned, I had many questions for myself. Would I be able to find someone who can fix the tyre? If the bike is fixed, would I have enough time to reach Xanamkhan town for the night? Would I be able to find a spare tube? What if the same thing is to happen again should I continue with the journey? Why am I doing such a trip when I can’t even patch a simple tyre? Should I end the trip altogether and try to find a truck to bring me back to Vientiane? Luckily, I found helpful locals at Namhi. I gratefully handed the bike over to them. But they were not familiar with the big bike and took some time tinkering with it. Meanwhile, a small crowd had gathered and a nice lady offered me some leaf-wrapped glutinous rice. It was my first bite of the day. Just as the sky darkened, the motorcycle was repaired. I was charged just US$1 for their effort. While I was extremely grateful for their help, I shamelessly inquire about possible lodgings in the village for the night. The friendly locals directed to a hotel (GPS N18 03.205 E101 51.539) located 4km from the village instead. We found the culprit to the puncture – a nail. And so I rode in the dark with flying insects smattering against my visor. The hotel was a creepy-looking row of rooms. Apart from a small house in front of the hotel where the owner lives, the whole place was isolated. Despite everything, I was glad to have a bed for the night. I paid US$6 for the room, one can of soya-bean milk, one can of energy drink and one bottle of mineral water. Staring at the mosquito net and spinning ceiling fan above me, I rested on head on the pillow, contemplating my plans for tomorrow. 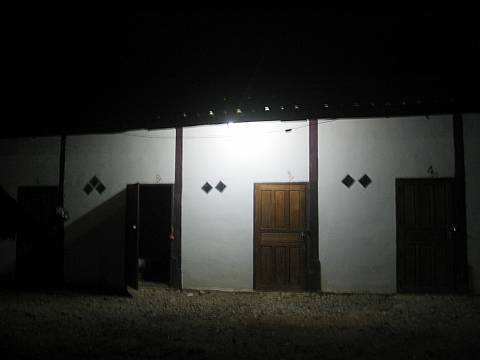 Each room is equipped with a bed, mosquito net, fan and bathroom. There is no hot water or air conditioning. This entry was posted in Laos, Motorcycle Adventure Vacations and tagged honda baja, Laos, namhi, pak Lay, vientiane, Xanamkhan, Xayaboury by atticus. Bookmark the permalink. Note that tigerairways have stopped flying to Udon Thani. Atticus, changing the tire is frightening but not that difficult (try it first with someone who knows what he’s doing ;-). That way, even if you never do it again yourself (you will however have more punctures), you’ll be able to assist the locals in changing your tube (always bring a front and back one with you). I learned it myself the hard way. It’s quite a shame that I can’t do much basic maintenance of motorcycles. It occurs to me that deep down inside, I might be wishing for accidents to occur and see what will happen.